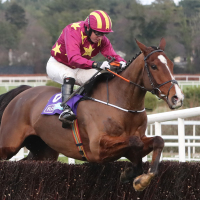 Henry de Bromhead is confident Monalee can vindicate his decision to step him back up in trip in the RSA Insurance Novices' Chase this afternoon. The seven-year-old will tackle the extended three-mile Grade One contest having won over two miles and five furlongs at Leopardstown last time out. "He is in good form and he seems well. It was a great run at Leopardstown and I'm happy. I think he is a three-mile horse," said De Bromhead. "I know a lot of people think he should be going for the JLT. It was two-mile-five last time and he needed that last furlong. If I blocked everyone else apart from the trainer, jockey and owner, there would hardly be a discussion. "For me he is a three-mile horse. If it was two-five maybe you would start considering it, but it is 20 yards short of two miles and four furlongs. "Death Duty beat him out of sight over two and a half over hurdles. It was two-five at Leopardstown on soft ground and he needed every inch of it, I thought. "I don't think there is any penalty kick and there are some very good horses in it, like Invitation Only and Terrefort. We are happy and we think he is a three-mile horse. We hope we have made the right decision, but all will be revealed. "He has won over three miles on bottomless ground at Clonmel and he loved it. I always thought he was more dependent on soft ground than good ground, but he seems to handle anything." Last year's Pertemps Final winner Presenting Percy is reported to be in sparkling form ahead of his return to Cheltenham. Although suffering defeat at the hands of Irish Grand National winner Our Duke last time out, connections of the Patrick Kelly-trained seven-year-old are hoping he can follow up last year's triumph on his first start in Grade One company over fences. Owner Philip Reynolds told At The Races: "He gave us a super day last year. It was following on from Mall Dini the year before and I never thought lightning would strike twice, but it was fantastic. "He's a wonderful horse and he's been a great servant. He's run 15 times for us, winning eight and being placed three or four times. It's very hard to get a horse as special as that. We're very lucky to have him. "I think opinion is probably split on whether his last run was a good run or a bad run, given we were getting weight from Our Duke, but I think people forget Our Duke won an Irish National by 14 lengths. "To me it was a good run - I think he ran to his mark. I would have preferred it if he'd won on the day, but I think it was a fantastic performance, particularly for a novice. "I don't think it was an overly hard race and he's absolutely flying since. He's in great, great form. "I think Monalee is a huge danger to us. Outside that, I'd pick Elegant Escape as our main danger." Elegant Escape has proven a model of consistency since being switched to fences and with soft conditions expected to suit, a big run is being predicted for the Colin Tizzard-trained six-year-old. Assistant trainer Joe Tizzard said: "I love the way the ground is looking - he's an out-and-out galloper. "His Newbury form with Black Corton is as good as there is in this country and there is not masses between the Irish horses. "He's a horse that's progressing all the time and he had a lovely confidence-booster at Exeter last time." Paul Nicholls feels the emphasis on stamina will play into the hands of Black Corton, who will be bidding to claim an eighth victory under jockey Bryony Frost this season. Nicholls said: "What I like about him is that, as you saw at Ascot, he jumped the last and was then gone - he took a bit of pulling up. "He is really strong at the back-end of his races and that hill will suit him."